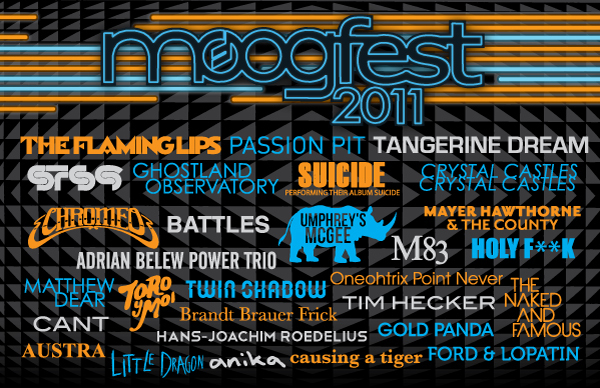 For all you people who keep asking, "What's Moogfest?" Here's a recap of this awesome festival in Asheville, NC... It pays tribute to Bob Moog, inventor of the modern synthesizer and founder of Moog Music, now located in a renovated brick building right in town. This year the Halloween weekend event expanded from four to six venues with approximately 25 acts to choose from a night and four afternoon panels/workshops during each day. It was also attended by 28,000 people, catching a wide variety of acts such as The Flaming Lips' Wayne Coyne, Dan Deacon, plus NBC's "Community" and Childish Gambino frontman Donald Glover. My write up for PopMatters is here and see posts from the weekend: Day 1, Day 2 and Day 3 on the blog for a more complete review of Moogfest 2011. Leaving town, I also happened upon a key turning point in my life. After running into Brian Eno in passing at our hotel, we were behind him in line at the airport to check in as he searched his bag for any identification. Eno was actually relieved to see us as he explained to the airport personnel that we were "together at the festival" so we could vouch for him. Explaining that passport had been stolen, we were honored to be in such a position but felt for the guy as he said it'd had even happened before. Paul would later joke that it'd be a hard Halloween costume to pull off but for that moment we were more concerned with just getting him on our plane. Fortunately, it was a small airport and there were only a few obstacles. As we were waved along, I took his elbow and told him how I had a very famous English name, Jane Seymour like the favorite wife of King Henry the Eighth, and to page me if needed. Photo in our hotel lobby - he liked Paul's hat! Paul and I went ahead through security to the gate and sat listening to a U2 song playing through the sound system, how ironic. Not only did Eno write the influential electronic music composition called "Music for Airports" in 1978 but he produced that U2 album back in the day. If the airport staff only knew! I went back to see if Brian Eno had made it through the security line when I heard that charming man's accent call soft and low, in the dulcet tones of a soothing baritone. "Jane." I can honestly now say I like my name -- it's my mother's name so I never felt like it was my own, growing up with various nicknames. I quickly turned around to see him behind me in the shopping kiosk, happily browsing for reading material. We had a quick chat about how lucky he was to make it through the boarding process. Later, he even joined us sitting by the gate and as we all just heard the Talking Heads song, "Take Me to the River." "You know I was listening to that and thought, what a great song it was," Eno told us. "I totally forgot I had anything to do with it!" We all had a good laugh as the conversation turned as he asked us what business we were in and why we were at Moogfest. A fan came over and rambled on about how he loved Eno's music etc. (Probably just like we sounded as we rode the hotel elevator with him days earlier!) There was a pause before Eno stood up and shook his hand to send the fanboy on his way. We were able to continue our beyond-the-surface experience with the icon before boarding the flight. 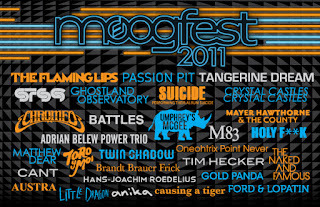 So here's to Moogfest and all it offers. Start making plans to travel to this unique, artsy town this October!